Militant Islam Monitor > Weblog > Muslim Youth Leader Tayabb Yunus at ICNA 2000 conference :"Now is the time...to send your child to fight Jihad in Chechyna"
Muslim Youth Leader Tayabb Yunus at ICNA 2000 conference :"Now is the time...to send your child to fight Jihad in Chechyna"
"It's bad enough that only one of five articles discussing the Beslan atrocity mentions its Islamist origins; worse is the miasma of words that insulates the public from the evil of terrorism. " "Calling a Terrorist a Terrorist"
While on the subject of the Beslan atrocity media coverage, it is noteworthy that as of 10 a.m. EDT today, only 1,470 English-language articles on the subject mentioned any variation of the words Islam or Muslim and 4,400 articles mentioned neither, which is to say that only one out of four articles bothered to refer in any fashion to the source of the violence. Hostages are gathered below explosives strung from basketball hoops in the gymnasium of School No. 1 in Beslan, Russia, in video footage filmed by the hostage-takers. MIM: In less then a month,Chechen terrorists have perpetrated a suicide bombing at a subway station in Russia, 2 airplanes which were downed by female suicide bombers, and a hostage taking at a school involving more then 1000 students parents and teachers. The bloody aftermath of the school seizure left at least 329 people dead and 200 unaccounted for .Many of those killed were children who were shot in the back by the terrorists when tbey attempted to flee the building after the killers detonated explosives and blew off the school roof . Several of the Chechen terrorists in the school were woman . The suicide bombers who detonated themselves simultaneously on two separate planes and were referred to as "black widows" women whose Chechan terrorists husbands had died waging "Jihad". It is now known that the murderous hostage taking at the Russian school was carried out by men and women of different nationalities including Arabs . The weapons used had been planted by operatives who had been engaged in construction work at the school in the months prior to the attack . The group and people behind these attacks are being described as Chechen rebels . They operate as an offshoot of Al Qaeda some of whose leaders are from Saudi Arabia. The Chechen website, http://web.archive.org/web/20010801152634/http://web.archive.org/web/20010801152634/http://web.archive.org/web/20010801152634/http://web.archive.org/web/20010801152634/http://web.archive.org/web/20010801152634/http://web.archive.org/web/20010801152634/http://web.archive.org/web/20010801152634/http://www.qoqaz.org/, acts as a message board for the group and gives information on how to join fighters known as Muhajideen, Below the Jihad in Chechnya 'logo' with a picture of Aslan Mashkadov Shamal Basayev and a prayer to aid in the defeat of the Russians. It must be pointed out that many mosques and Islamist institutions in the US openly solicit funds and recruit fighters for Jihad in Chechnya. The Jihad in Chechyna logo below came from a URL which had been on the website of the Islamic Center of Boca Raton, Florida, before their website 'dissapeared' as a result of media scrutiny into the terrorist links on their website . The youth is very important…And, we all want to see our youth to succeed to become doctors, to become engineers; but how many of you can actually say that you want to send your sons to Jihad, to Chechnya? How many of you can actually say that? [Takbir! Allahua Akbar!] How many of you can actually say that you want to send your child… How many of you can actually say that you want to send your youth to fight in Jihad or to send them to…to these Islamic Institutions to become educated? I'm sorry. Other than that, I honestly believe in my heart that this is the time, right now is the time. MIM: See web domain registration of the Universal Heritage Foundation in Kissimee, Florida listing Zulfiqar Ali Shah as domain registrant and Tayyab Yunus as tech support at the bottom of the page ,this listing shows the connection between the Tayabb Yunus, head of the Muslim Youth and Zufiqar Al Shah,( former president of ICNA) with ICNA/MAS - Muslim Youth and the UHF. Islamic Activism - "What-Why and How? Stand up for Peace, and Justice, and that is exactly what we did at this year's ICNA Convention in Cleveland, Ohio. The landmark event started off with Jummah Salat, with Sheikh Abdur Rehman Sudais giving the Khutbah and leading the Prayer. Then Sheikh Ekrima Sai'd Sabri the Imam of Masjid Al Aqsa, led the forefront of the Muslims in a rally for peace and justice for Palestine, Kashmir, and Chechnya. Young Muslims played a vital role in the convention. YM held its parallel sessions that included various speeches and workshops. Imam Zaid Shakir, Sheikh Shakir Elsayed, Dr. Abdullah Idrees Ali, Sheikh Mukhtar Mugraoui, Br. Altaf Hussain and Br. Tayyab Yunus were some of our speakers. The topics Included: "The Decisions we make", "Join us in our struggle", "The Deen of Your Friends", "Islamic History: A Model for Justice", "How to establish a MSA in your school/college", and "Islamic Activism: What, Why and How ?". Link to Muslim Youth website and article above with Jihad Camp link. The speakers at the 2001 convention of the ICNA Muslim Youth underscores the Jihad agenda of the Muslim Youth organisation. Note that one of the themes was "Join us in our struggle ." One year after calling for parents to send their children for Jihad in Chechyna, Tayabb Yunus spoke together with the Grand Mufti of Al Aqsa, Ikrima Sabri, and the Saudi Imam Abdur Rahman Al Sudais a demonstration calling for "peace and justice in Palestine, Kashmir and Chechyna". Ikrima Sabri praised child suicide bombers saying : "The younger the martyr the more I rspect him" . Abdur Rahman Al Sudais went on Saudi television and called for Muslims to "murder Jews and American worshippers of the cross". MIM the Islamic Center of Boca Raton proudly announced their new new link to the 'Jihad in Chechyna 'website, the pages below were saved and are among the many which were pulled after the ICBR website aft came under media scrutiny for links to Al Qaeda and Hamas affiliated organisations, and were accused of having virulently anti semitic essays on their website . ICBR webpage from 2001 - A click on the Jihad in Chechyna link on the ICBR site leads to the homepage of Jihad in Chechnya and Qoqaz which is linked to Al Qaeda. Islamic Games and Quizes for all ages in the Kids Corner! All praise is due to Allah Who guided us to the straight path and made us Muslims. We ask Him to help us stay on the right path and serve Islam in the best manner. The Islamic Center of Boca Raton maintains facilities for the establishment the five daily prayers including Friday Congregational prayers (Salaat-ul-Jumua). In addition ICBR offers daily Halaqa's (educational gatherings) after Maghrib prayer, a modest Islamic library, Islamic and general public educational lectures, an active Da'awa Center, and a wide host of Social Activities, as well as other services. We strive our utmost inshallah to keep all of such activities grounded in and conducted according to the Quran and Sunnah, with strict attention given to avoiding any innovations (Bida'). May Allah, the Most High increase our Iman, and reward the efforts of those who strive both in prosperity and in adversity to serve Him (SWT). Please feel free to contact us for more information. All Masjid activities and information are located on this web site. DISCLAIMER: Qoqaz.net is an independent site and a translation of the Arabic Sawt-ul-Qoqaz. It has no affiliations or agreements with the latter. How do I Train Myself for Jihad? Disclaimer: Translated sites and their maintainers have no direct affiliation with Azzam Publications.
" Russia offers 10 ml for Chechen rebels "
MOSCOW - Russia offered a $10 million reward on Wednesday for information to help it hunt down Chechen rebel leaders Shamil Basayev and Aslan Maskhadov, whom it accuses of being behind last week's deadly school siege. State television read an FSB security service statement saying it would pay up to 300 million roubles ($10.3 million) for information that led to "neutralising" the two rebels. At least 335 people were killed – half of them children – in the siege at a school last week in southern Russia. The Chechen pair already had bounties on them after Ramzan Kadyrov, the son of slain Chechen president Akhmad Kadyrov, offered in December to pay $5 million for Basayev and $50,000 for Maskhadov, saying Basayev posed a much graver threat. The school siege followed a string of attacks blamed on Chechen rebels, including the downing of two passenger planes and a suicide bombing in central Moscow. The Foreign Ministry said in a statement on Tuesday evening it would step up its efforts to persuade Britain to extradite Maskhadov's spokesman Akhmed Zakayev, who was granted asylum last year. An unknown Chechen rebel group called the Black Widows organised the siege of a school in the Russian city of Beslan in which hundreds of children, their parents and teachers were killed. Authorities in the Russian capital insist Al Qaeda-sponsored militants, including at least?10 Arabs, were responsible for the tragedy. But independent sources have indicated from day one of the bloody event that more than five armed women were not only among the militants, but that one of them led the group. In the past few years, Shamil Basayev, an extremist Chechen separatist leader, has owned responsibility for many incidents in which innocent civilians have been killed. But this time there has been no word from Basayev, leaving the media guessing. Some journalists in Moscow received anonymous calls on the second day of the siege in Beslan, saying?the extremists had communicated their demands to the authorities but the latter were not making them public. The demands included?the expulsion of Russian troops from Chechnya and the release of more than 8,000 Chechen prisoners from Russian jails. The anonymous callers also claimed that the group responsible for the siege called itself Black Widows of Chechnya and comprises women whose husbands and other loved ones had been killed by Russian troops?over the last?10 years. The name Black Widows surfaced in July 2003 when a Chechen woman, Zarema, was arrested in Moscow with a bomb in her bag. An explosives?expert was brought in to defuse the bomb, but it went off and killed him. A Moscow court found Zarema guilty of terrorism?and attempted murder and sentenced her to 20 years in prison. Another source said the name of the woman leading the Beslan operation was Khaula Nazirov, a 45-year-old widow from Grozny, the Chechen capital. Her 18-year-old son, 16-year-old daughter, and some other relatives were also part of the operation. They attacked the school because Nazirov's husband was tortured to death?in a Russian military camp five years ago, while some of her children's cousins were killed when Russian troops bombed a school in Chechnya some years ago. The latest wave of violence in Russia is related to the presidential election held in Chechnya on August 29. President Vladimir Putin visited Grozny a few days before the election to convey the impression of complete peace in the region. He also rejected the possibility of talks with the separatists. Violence began two weeks before the election. More than 46 people were killed in the first three weeks of August in Chechnya, but Russian authorities continued to downplay the situation. Two planes were destroyed near Moscow on August 25?by suicide bombers, killing more than 90 people. But once again the government claimed?there was no clear evidence of terrorism. It was Moscow Times that published the names of two Chechen women suicide bombers who destroyed the planes. Amnat Nagayeva, 30,?destroyed the Tu-134 and Satsita Dzhebirkhanova, 37,?destroyed the Tu-154. All their relatives went underground after the event. Both women were close friends and lost their husbands a few years ago in the Chechen war. After this incident and the election in Chechnya, it was only to be expected that?the rebels would increase their attacks, but common Russians were unaware of the situation because the largely State-controlled media had carried on chanting that things were now normal in the breakaway southern republic. Last month I was the first Pakistani journalist ever to enter Chechnya. I was with two dozen other journalists from European and Arab countries. All of us were stopped from visiting polling stations in Grozny after 3 pm because there were no voters. We were all taken to the 46th Brigade headquarters of the Russian army and confined to the camp. The next day the authorities announced that pro-Moscow candidate Ali Alikhanov had got 73 percent of the votes and would succeed Akhmad Kadirov as president. Kadirov was killed on May 9?in?a bomb blast at the Grozny stadium. people were killed. Once again a Chechen woman was behind the operation. We were told by some Chechens in Moscow that most of the Black Widows are not very well educated, have little knowledge of Islam, and don't know that killing innocents in the name of Islam is forbidden. These widows are simply looking for revenge. They are being trained by fighters of Shamil Basayev, who is known to have had contacts with Osama bin Laden in the past. Dmitry Peskov, an official?in the president's office in Moscow, told us that Chechen rebels are getting arms from the thriving black market in the Central Asian states. He said Russian authorities had recovered Pakistani, Turkish and Bosnian passports from some militants killed recently in an operation on the border?with Georgia. He believed the militants were hiding in Georgia and returning on fake documents. Peskov said the Pakistani passports were printed in Moscow, which meant the Pakistani government was not directly responsible for aiding the Chechen militants. Some other sources claimed that Russian intelligence had received information many weeks ago that some Chechen women trained in Pakistani tribal areas as suicide bombers were heading for Russia, but the government in Moscow did not comment on it. Official sources in Moscow refused to say why the demands?of the militants who held the Beslan school hostage were not made public, but some observers think the whole affair was mishandled by Russian security forces. According to sources, the militants sent a message through a woman that they wanted to address a press conference to explain why they had targeted a school. The Russian authorities had initially indicated that they were ready to negotiate, but it turned out that they were only buying time for a military operation. When commandos stormed the school, three women suicide bombers blew themselves up, killing?hundreds of others along with them. The whole of Russia is in shock now. The ruthless Black Widows have successfully shown that all is not right with Chechnya, and that they will not accept an ex-police officer as the new president. Putin must engage the separatists in dialogue. He can still talk to Aslan Maskhadov,?the moderate Chechen general who served in Afghanistan as a Soviet army officer for many years. Maskhadov was accepted as president of Chechnya in 1997, when he contested the election against Shamil Basayev on a platform demanding independence from Russia. But two years later, Russian troops attacked Chechnya and seized Grozny, forcing Maskhadov to flee into exile, after?he failed?to stop Basayev from organising?an insurgency in neighbouring Dagestan. Below : Chechen terrorist leaders Shamil Basayev and Aslan Maskadov are considered heroes by Muslims in the US and abroad. Websites of most Islamic centers and organisations openly solicit donations for "the struggle" in Chechnya and the director of the Muslim Youth group of the Islamic Circle of North America , Tayebb Younus, has openly called for parents to sent their children for Jihad in Chechyna. Oh Allah, defeat your enemies, defeat the Russians! Oh Allah! Scatter their aim, shake the earth beneath their feet, strike fear into their hearts. Oh Allah! Cripple their limbs and blind their sight, and send upon them epidemics and calamities. and make their destruction a lesson for those who do not learn lessons. Oh Allah! Hasten their destruction, and make their wealth a bounty for the Muslims. Oh Allah! Aid our Mujahideen brothers in Chechnya. Oh Allah! Unify their ranks, and gather them on the word of truth. and make them steadfast, and bestow upon them tranquillity. Oh Allah, put their hearts at peace and guide them to that which is all-good. infinite armies in the heavens and the earth. Messenger of Allah and upon all his followers and companions. "In the Name of Allah the All-Merciful and Compassionate, Praise to the Master of the World and prayers for our Master Muhammad." "I hope that this tape reaches you when you are in a good situation. In this tape, I want to advise that it is no secret that there will be a presidential election in Russia in the coming months, and those months will be of the most significant ones. "The Mujahideen are trying to escalate the operations in order to topple Putin, Allah willing. Putin is trying by any and all means to present himself during these months as a victor, in order to win the elections. These months will be difficult and important to this issue. Disregarding the matter at this stage is most dangerous to the Mujahideen operations. Every Amir  who will receive less aid finds it hard to act, since every operation requires cars, ammunition, intelligence, weapons, food, medical care, and mobility; therefore, if aid to that Amir shrinks, he will find it hard to move and act. Allah willing, in the future the situation will improve, and this is one of the most important reasons for sending this tape. "Regarding the situation in Iraq and the guerilla war - There must be there [in Iraq] a political element, an information element, and a preaching element alongside the military front. The lessons of the past in fighting the colonialists is that those who receive the state are the secularists and the apostates. We must not repeat this mistake. "Therefore, it is essential that the Jihad groups there [in Iraq] unite and not separate, and that they have the political dimension to assemble the Sunnis, including the Kurds, the Arabs, and the Turkmenis. All must be united under the same political power. Similarly, there must be an information and a religious preaching arm. "My recommendation is that a Fatwa be issued, to be signed by a large number of clerics, and to be directed at the Jihad groups, advising them to unite and to learn the lesson from the cases in the past when the secularists took the regime. "Similarly, I recommend to the Mujahideen that instead of engaging in clashes and warfare against the Saudi government,  it is better to go to Iraq. There, there are weapons aplenty and there they can fight the Americans. It is no secret that great damage will be caused the Americans if the Mujahideen turn to Iraq to fight them. "As for the clashes in Saudi Arabia, there is no doubt that they gladden the Americans. It gladdens them that the Mujahideen are killed by the Saudi government. I recommend to the youth to act according to their interests and to turn to Iraq instead of dealing with confronting the Saudi government. To hear the original Arabic, please visit http://qoqaz.com/ab.rm. For more on the assessments of terrorist threats, please see MEMRI Inquiry & Analysis #156: "Assessing Islamist Web Site Reports Of Imminent Terror Attacks In The U.S. " http://memri.org/bin/ latestnews.cgi?ID=IA15603. MIM: From San Diego to Afghanistan : Al Qaeda and the AIG are "proud to report" the martyrdom of an American Shahada ' who was killed in Chechyna helping his Muhajideen brothers in Chechnya. Mohamed Zaki earned the dubious distinction of being the first American to be killed while waging 'Jihad' under the guise of aid worker in Chechnya. NOTE: WE APOLOGIZE FOR THE DELAY IN RELAYING THE NEWS. THANK YOU FOR YOUR PATIENCE. Russian enemy units were forced to retreat from main Chechnyan cities due to heavy continuous night attacks by Mujahideen. Russian enemy soldiers are not used to the area, and are usually holed up in their armor and trenches at night. Mujahideen tactics include slipping among Russian units, then starting up an attack between the units, in the confusion, the terrorized enemy soldiers start hitting each others with heavy machine gun fire, rockets and artillery, Mujahideen meanwhile withdraw, and Russians continue attacking each others units for several hours, All grace be to Allah. MIM:From the youth pages of Jihad In Chechyna - Hi tech web design to glorify death and bloodshed. 'Atrocity photos 'of unknown origin and authenticity are designed to enrage and incite acts of revenge are displayed in pages which are accessible by clicking on the moving hands below the Jihad and Enemies gallery. Western apologists often cite the treatment of Chechens by the Soviets as a justification for their violent acts while deliberately ignoring the militant Islamist agenda behind the bloodshed. LINGUIST List: Vol-6-22. Fri 13 Jan 1995. ISSN: 1068-4875. Author's note: I have been doing linguistic field work on Chechen and its close relative Ingush for many years. Though I am not an ethnographer or historian, I have tried to bring together here some general information about the Chechen people and their language in order to increase public awareness of the people and their situation, and to put a human face on a people of great dignity, refinement, and courage who have paid heavily for their resistance to conquest and assimilation. This paper may be copied freely. If you disseminate it electronically or print it out yourself (which you are welcome to do), reformatting (font, spacing, etc.) is OK but please do not edit it. The Chechens and their western neighbors the Ingush are distinct ethnic groups with distinct languages, but so closely related and so similar that it is convenient to describe them together. The term "Chechen" is a Russian ethnonym taken from the name of a lowlands Chechen village; "Chechnya" is derived from that. (Both words are accented on the last syllable in Russian.) This term evidently entered Russian from a Turkic language, probably Kumyk (spoken in the northern and eastern Caucasian plain). The Chechens call themselves Nokhchi (singular Nokhchuo). Similarly, "Ingush" is not the self-designation but a Russian ethnonym based on a village name; the Ingush call themselves Ghalghay. 1989 census figures: 956,879 Chechen; 237,438 Ingush. The Chechens are the largest North Caucasian group and the second largest Caucasian group (after the Georgians). The Chechen and Ingush lands lie just to the east of the principal road crossing the central Caucasus (via the Darial Pass), extending from the foothills and plains into alpine highlands. The lowlands enjoy fertile soil, ample rainfall, a long growing season, and a small oilfield. Neighbors to the east are the various peoples of Daghestan (many of them speaking languages related to Chechen); in the plains to the north, the Turkic-speaking Kumyk and (as of the last three centuries) Russians; to the west the Ingush and to their west the Ossetians, who speak a language of the Iranian branch of Indo-European; to the south (across the central Caucasus range) the southern Ossetians and the Georgians. There are two true cities in Chechen and Ingush territory: Grozny (pop. about 400,000 until 1995), the modern Chechen capital founded as a Russian fort during the Russian conquest of the Caucasus; and Vladikavkaz (pop. about 300,000; known as Ordzhonikidze in Soviet times) in the Ingush highlands at the Ingush-Ossetic territorial boundary, also originally a Russian military fort and founded to control the Darial pass. Nazran in the Ingush lowlands was traditionally and is now a large and important market town. The cities had substantial Russian and other non-Chechen-Ingush population; Vladikavkaz was mixed Ingush and Ossetic with significant numbers of Russians and Georgians. (Groznyj has now been destroyed and mostly depopulated by Russian bombing. Vladikavkaz and the adjacent Ingush lands were ethnically cleansed of Ingush in late 1992.) All Russian governments -- czars, Soviets, post-Soviet Russia -- have used various means to remove Chechen and Ingush population from economically important areas and to encourage settlement there by Russians and Russian Cossacks; hence the mixed population of the cities and lowlands. The Caucasus has been famed since antiquity for the sheer number and diversity of its languages and for the exotic grammatical structures of the language families indigenous there. This diversity testifies to millennia of generally peaceable relations among autonomous ethnic groups. Chechen and Ingush, together with Batsbi or Tsova-Tush (a moribund minority language of Georgia) make up the Nakh branch of the Nakh-Daghestanian, or Northeast Caucasian, language family. There are over 30 languages in the Northeast Caucasian family, most of them spoken in Daghestan just to the east of Chechnya. The split of the Nakh branch from the rest of the family took place about 5000-6000 years ago (thus the Nakh-Daghestanian family is comparable in age to Indo-European, the language family ancestral to English, French, Russian, Greek, Hindi, etc. ), though the split of Chechen from Ingush probably dates back only to the middle ages. The entire family is indigenous to the Caucasus mountains and has no demonstrable relations to any language group either in or out of the Caucasus. Like most indigenous Caucasian languages Chechen has a wealth of consonants, including uvular and pharyngeal sounds like those of Arabic and glottalized or ejective consonants like those of many native American languages; and a large vowel system somewhat resembling that of Swedish or German. Like its sister languages Chechen has extensive inflectional morphology including a dozen nominal cases and several gender classes, and forms long and complex sentences by chaining participial clauses together. The case system is ergative, i.e. the subject of a transitive verb appears in an oblique case and the direct object is in the nominative, as is the subject of an intransitive verb (as in Basque); verbs take no person agreement, but some of them agree in gender with the direct object or intransitive subject. 97% or more of the Chechens claim Chechen as their first language, though most also speak Russian, generally quite fluently. Chechen and Ingush are so close to each other that with some practice a speaker of one has fair comprehension of the other, and where the two languages are in contact they are used together: a Chechen addresses an Ingush in Chechen, the Ingush replies in Ingush, and communication proceeds more or less smoothly. Chechen was not traditionally a written language. An orthography using the Russian alphabet was created in the 1930's and is used for various kinds of publication, although for most Chechens the chief vehicle of literacy is Russian. Traditionally, as in most North Caucasian societies, many individuals were bilingual or multilingual, using an important lowlands language (e.g. Kumyk, spoken in market towns and prestigious as its speakers were early converts to Islam) for inter-ethnic communication; any literacy was in Arabic. Russian has now displaced both Kumyk and Arabic in these functions. Particularly if the Chechen and Ingush economies continue to be destroyed and unemployment and mass homelessness continue to undermine the social structure, there is danger that Chechen and Ingush will be functionally reduced to household languages and will then yield completely to Russian, with concomitant loss of much of the cultural heritage. The Chechens have evidently been in or near their present territory for some 6000 years and perhaps much longer; there is fairly seamless archeological continuity for the last 8000 years or more in central Daghestan, suggesting that the Nakh-Daghestanian language family is long indigenous. The Caucasian highlands were apparently relatively populous and prosperous in ancient times. From the late middle ages until the 19th century, a worldwide cooling phase known as the Little Ice Age caused glacial advances and shortened growing seasons in the alpine highlands, weakening the highland economies and triggering migrations to the lowlands and abandonment of some alpine villages. This period of economic hardship coincided with the Russian conquest of the Caucasus which lasted from the late 1500's to the mid-1800's. In all of recorded history and inferable prehistory the Chechens (and for that matter the Ingush) have never undertaken battle except in defense. The Russian conquest of the Caucasus was difficult and bloody, and the Chechens and Ingush with their extensive lowlands territory and access to the central pass were prime targets and were among the most tenacious defenders. Russia destroyed lowlands villages and deported, exiled, or slaughtered civilian population, forcing capitulation of the highlands. Numerous refugees migrated or were deported to various Muslim countries of the middle east, and to this day there are Chechen populations in Jordan and Turkey. Since then there have been various Chechen rebellions against Russian and Soviet power, as well as resistance to collectivization, anti-religious campaigns, and Russification. In 1944 the Chechens and Ingush, together with the Karachay-Balkar, Crimean Tatars, and other nationalities were deported en masse to Kazakhstan and Siberia, losing at least one-quarter and perhaps half of their population in transit. Though "rehabilitated" in 1956 and allowed to return in 1957, they lost land, economic resources, and civil rights; since then, under both Soviet and post-Soviet governments, they have been the objects of (official and unofficial) discrimination and discriminatory public discourse. In recent years, Russian media have depicted the Chechen nation and/or nationality as thugs and bandits responsible for organized crime and street violence in Russia. The invasion of Chechnya presently underway has meant great human suffering for all residents of the Chechen lowlands, including Russians, but only the Chechens are at risk of ethnic cleansing, wholesale economic ruin, and loss of linguistic and cultural heritage. The Chechens and Ingush are Sunni Muslims of the Hanafi school, having converted in the late 17th to early 19th centuries. Islam is now, as it has been since the conversion, moderate but strongly held and a central component of the culture and the ethnic identity. Economy, customs. Traditionally, the lowlands Chechen were grain farmers and the highlanders raised sheep. At the time of Russian contact the lowlands were wealthy and produced a grain surplus, while the highlands were not self-sufficient in food and traded wool and eggs for lowlands grain. Chechen social structure and ethnic identity rest on principles of family and clan honor, respect for and deference to one's elders, hospitality, formal and dignified relations between families and clans, and courteous and formal public and private behavior. Kinship and clan structure are patriarchal, but women have full social and professional equality and prospects for financial independence equivalent to those of men. Academics, writers, artists, and intellectuals in general are well versed in the cultures of both the European and the Islamic worlds, and the society as a whole can be said to regard both of these heritages as their own together with the indigenous north Caucasian artistic and intellectual tradition. Until the Russian conquest the Chechens were an independent nation with their own language and territory but no formal political organization. Villages were autonomous, as were clans. Villages had mutual defense obligations in times of war, and clans had mutual support relations that linked them into larger clan confederations (which generally coincided with dialects). Each clan was headed by a respected elder. There were no social classes and no differences of rank apart from those of age, kinship, and earned social honor. Anonymous. 1992. Ethnic cleansing comes to Russia. The Economist, November 28, 1992, p. 60. Blanch, Lesley. 1960. The Sabres of Paradise. New York: Viking. Comrie, Bernard. 1981. The Languages of the Soviet Union. Cambridge: Cambridge University Press. Conquest, Robert. 1970. The Nation Killers: The Soviet Deportation of Nationalities. London: Macmillan. Critchlow, James. 1991. "Punished peoples" of the Soviet Union: The continuing legacy of Stalin's deportations. Helsinki Watch Report. New York-Washington: Human Rights Watch. Friedrich, Paul, and Norma Diamond, eds. 1994. Encyclopedia of World Cultures, vol. VI: Russia and Eurasia/China. Boston: G. K. Hall & Co.
Gamkrelidze, T. V., and T. E. Gudava. [Various dates.] Caucasian languages. Encyclopedia Britannica (e.g. in 1979 edition, Macropedia, vol. 3, pp. 1011-15; in 1992 edition, vol. 22, pp. 736-40, under 'Languages of the world'). Nekrich, Aleksandr M. 1978. The Punished Peoples. New York: Norton. Nichols, Johanna. 1994. Chechen. Ingush. In Rieks Smeets, ed., The Indigenous Languages of the Caucasus, vol. 4: Northeast Caucasian Languages, pp. 1-77 (Chechen), 79-145 (Ingush). Delmar, NY: Caravan Books. Wixman, Ronald. 1980. Language Aspects of Ethnic Pattern and Processes in the North Caucasus. (University of Chicago Department of Geography Research Paper no. 191.) Chicago: University of Chicago Press. Chechen periodical Jihad Today, published undercover in Chechnya, released the material titled «Jihad And Its Solution Today» prepared by the Shariah Council of State Defense Council «Majlis al-Shura» of CRI (Chechen Republic of Ichkeria). This material was forwarded to K.C. via e-mail. K.C. is publishing it with little abridgements. «And continue to remind, for surely the reminder profits the believers». Hanbali School (one of the four Shariah Scientific Schools, «Madhabs» – K.C.) defined it as spending power and energy in the war in the way of Allah by personal participation, property, word, etc. Maliki School considers it a war (a battle) of a Muslim with a Kafir (an infidel) who has no treaty, to exalt the Word of Allah, or who trespassed on the territories of Muslims. Hanbalis say that this is a war against Kafirs (the infidels), unlike an armed fight with the Muslims bordering on being rebels, or brigands or robbers for an example. (Mugni-Muhtaj, vol. 6, page 4). After reading this we hope it is clear that the war operations that Muslims are conducting against foreign aggressors in Chechnya are Jihad. «O ye who believe! When ye meet the unbelievers in hostile array, never turn your backs to them». 2. When the enemy entered a territory, a city or a village where Muslims are living, then everybody is obligated to go to war. 3. When a country's ruler mobilized some of the men of the full legal age. Ibn Abbas told that the Messenger of Allah (peace be upon him) said: «There is no Hijra from Mecca to Medina after Mecca was taken, but the Jihad and the intention remains, therefore if you get mobilized, then come out». (Fikh al Sunna). «…And righteous ancestors, and followers,… and scholars, and commentators of the Koran are unanimous in the opinion that in this case Jihad becomes mandatory for the residents of the country that was attacked by Kafirs and for its closest neighbors. So, son should come out without permission from his father, a wife without permission from her husband, and debtor without permission from his creditor. If there are not enough of these people, i.e. residents and neighbors, or if they show negligence and carelessness or taking no actions to repulse the enemy, then this obligation extends to all Muslims». «And as far as defensive war goes, this is the most important type of repulsing the aggressor and defending the people and the religion. It is mandatory by unanimous opinion of the scholars, since the aggressor destroys the religion and after the faith in Allah there is nothing more important than repulsing the enemy, and there are no other conditions for a person (that would exempt him from participation)». We think that after quoting these examples it will be clear that the Hukma (the Decision) of Jihad for Chechnya and its neighbors today is mandatory (Fard'Ayn). And there are no other interpretations implied here. «Hajj and Jihad for Muslim rulers, for the devout as well for the sinners, is carried out until the Day of Judgment, and there is nothing that takes it away or makes them vain». (Al-Akida at-Takawiyya). We acknowledge that many Amirs and Commanders are not an ideal, just like ordinary Muslims are not, they are often far from the examples of the disciples of the Messenger of Allah (peace be upon him). But the Shariah texts are undeviatingly demanding that the rulers of Muslims in Jihad are obeyed, except when they order to commit a sin. «If someone sees in his Amir something that he hates, let him endure, because verily, whoever dies after distancing from Jamaat even for a span, he dies a Jahili (ignorance) death». «Religion is sincerity (sincere wish of kindness, a good advice) concerning Allah, His Book, His Messenger, the leaders of Muslims and all Muslims». We cannot turn a blind eye to the faults or mistakes of the command, or especially support them in it; we must work hard to make them improve their personal qualities, to extend their Islamic knowledge and to promote the Shariah of Almighty Allah in all areas of our life. MIM:Tayabb Yunus is listed as the tech contact for the Universal Heritage Foundation in Kissimmee ,Florida . His call for parents to send children for Jihad in Chechyna can be seen at the top of the page . Registrant Organization:Universal Heritage Foundation, Inc.
Admin Organization:Universal Heritage Foundation, Inc.
Tech Organization:Universal Heritage Foundation, Inc.
"Jihad is ordained for you (Muslims) though you dislike it, and it may be that you dislike something which is good for you and that you like something which is bad for you. Allah knows but you do not know"
Our Jihad Camp will help educate the youth and provide them with the proper understanding of the concept of Jihad. This camp is for brothers with ages ranging from 14 to 25 years. The cost of the camp is $200 and includes transportation (if you travel with us), food, and accommodations. Attendees must also have the waiver form filled and signed. Many knowledgeable people will come and teach us. Many important lessons await. If you are accepted, you will be given further information at that time. You must bring the camp fee and the waiver form with you, they will be collected before departure. Submitting this form does not mean acceptance to the camp. We will review the list of applicants and make our best judgment on which applicant is deserving or suitable. There are 50 seats available. Date of application will affect heavily on the decision. We will contact you by e-mail. Brothers only. 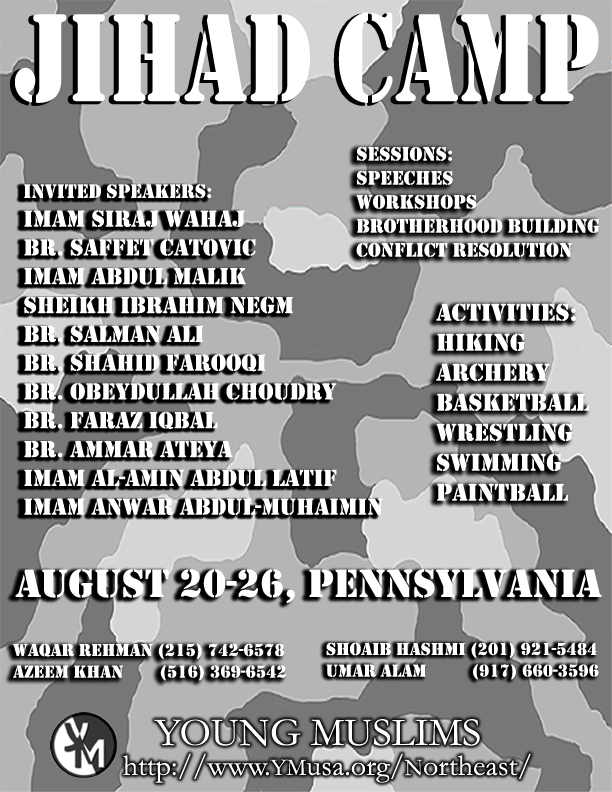 Please state in three sentences or less, why you want to come to this camp. Daytime Phone No. Evening Phone No.